The Transport Select Committee has been holding hearings on how to improve cycling safety. Our board member (and chair of New Cycling) Katja Leyendecker gave evidence last week. 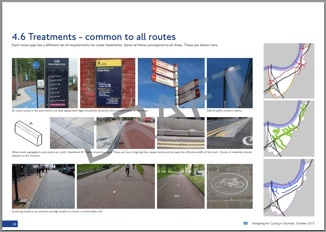 The Cycling Embassy of Great Britain considers the draft Designing for Cycling [pdf] document to be generally excellent, and we congratulate those involved in its production. Transport for London should look to this document as a guide to producing a cycling-friendly city. Campaigners across Scotland are joining forces to ask Scottish Finance minister John Swinney to double the budget for active travel - and keep on doubling it until it reaches 10% of the transport budget. The Stop Climate Chaos Coalition "We Want to See Double" demonstration will take place in Edinburgh at lunchtime (1 - 1:30 pm) on Wednesday 30th October outside St Andrew's House. The Shepherd's Bush West public realm scheme represents a considerable missed opportunity to make cycling an attractive, safe and convenient mode of transport, in light of the amount of carriageway space that is proposed to be taken away from both buses and private motor traffic. Following on from successful infrastructure safaris around the country, we are delighted to announce the next one in the series. You may ask "what is an infrastructure safari?" Read more on our infrastructure safaris here. She's been there right from the start. She gets things done. She normally humbly stays in the background - but her willpower and energy is palpable at every point along the way (which is physically separated from the fast heavy traffic of course). On Monday evening, 100 MPs of all parties voted unanimously in support of a motion welcoming the findings of the Get Britain Cycling report, in particular its recommendation of consistent funding for cycling, at a level of at least £10 per person, per year.